Having Three Column at the Top. 1. 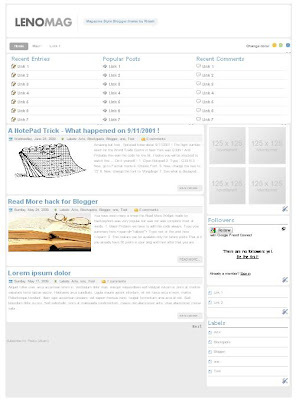 Login to your blogger dashboard. 4. search for this link "http://i274.photobucket.com/albums/jj244/riteshsanap/LenoMag/logo.gif"
2. Search for "<p><strong>Magazine Style Blogger theme by Ritesh</strong></p>"
3. Replace "Magazine Style Blogger theme by Ritesh" by your Slogan and Text.